Successfully Added TechPad - 7 Inch Android Tablet to your Shopping Cart. 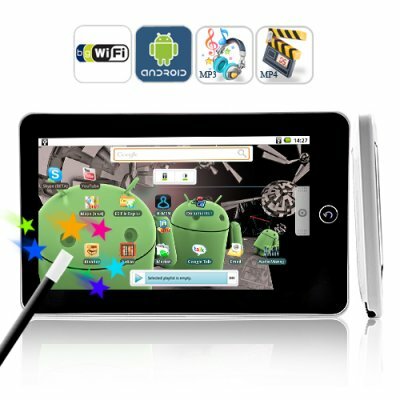 Meet the TechPad 7 Inch Android Internet Tablet, the newest and smartest tablet solution around. The TechPad merges the power of the Android OS with a 7 inch touchscreen to bring you the best way to experience the web, email, media, ebooks, games, and everything else. Anything is possible with the TechPad - let it make your life easier. Gain access to everything: Haven't heard of Android? It's only the most popular operating system in the world and includes true multi-tasking, widgets, and many more features that can't be found anywhere else. Best of all, the TechPad comes installed with convenient applications such as Gmail, Google Maps, and of course Google Android Marketplace, which is home to almost 100,000 other third-party applications (with top favorites being Twitter, Facebook). With the TechPad, there's nothing you can't do. High quality, low price: With an advanced 800MHz Samsung 6410 processor and 256MB of RAM, the TechPad Android Tablet will easily keep up with your every action and command. With everything so much faster and smoother than the competition, you can feel the difference in quality and know that you have a top-of-the-line device in your hands. Best of all, this affordable Android Tablet is the best bang for your buck today and brought to you at a factory-direct price that can't be matched. How do we do this? By cutting out the middle man and selling to you factory-direct with no markup and no extra fees! Hats OFF to Chinavasion. I got this piece within one week (of course a 3 day delay in Kuwait customs.) I am very much satisfied with the performance of this tiny Tablet. on 2011-02-25 20:19:44 Awesome Device. Awesome, I'm very impressed.I had high expectations but, this is even better!! Great!! Super fast delivery + excellent product + low price = AWESOME! I got it and i'm happy with it. Good stuff.